Cyclist In Orange Riding The Mountain Bike On The Autumn Rocky Trail. Extreme Sport And Enduro Biking Concept. 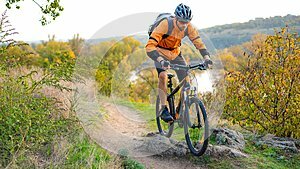 Photo title: Cyclist in Orange Riding the Mountain Bike on the Autumn Rocky Trail. Extreme Sport and Enduro Biking Concept. Cyclist in Orange Riding the Mountain Bike on the Autumn Rocky Enduro Trail. Extreme Sport and Enduro Biking Concept.